Tagged Values define a wide range of properties and characteristics of a model element, and some of these properties have complex or structured values. For example, you might want your user to select a value between upper and lower limits (using 'Spin' arrows), set a date and time, select a color from a palette, or work through a checklist. 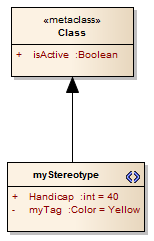 You create these complex Tagged Values from any of a number of predefined structured Tagged Value types and filters, some of which you might have created yourself (Settings | UML Types > Tagged Value Types); the attribute you create in the Stereotype element has the same name as the Tagged Value Type. Having created a structured Tagged Value, you assign it to the Stereotype element in the same way as for simple Tagged Values, by creating an attribute in the Stereotype element with the name of the Tagged Value Type. For example, to make the Tagged Value Handicap appear in a stereotype, create an attribute named Handicap. Depending on the tag type, you can set the default value for the tag by giving the attribute an Initial value.